What is the history of the Eagle? Is the sound different from a baroque recorder? Do you blow differently on an Eagle? How can I find out my breathing type? What is the physical difference between the head joints? Is there a difference in sound between a solar and a lunar head joint? Is it useful to specify a breathing type, when ordering an Eagle? Do you need to put more air into an Eagle? Why does the Eagle recorder sound very well with modern instruments? Can I combine an Eagle recorder with other recorders? Are there ‘in between’ or ‘mixed' breathing types? What is the range of an Eagle? 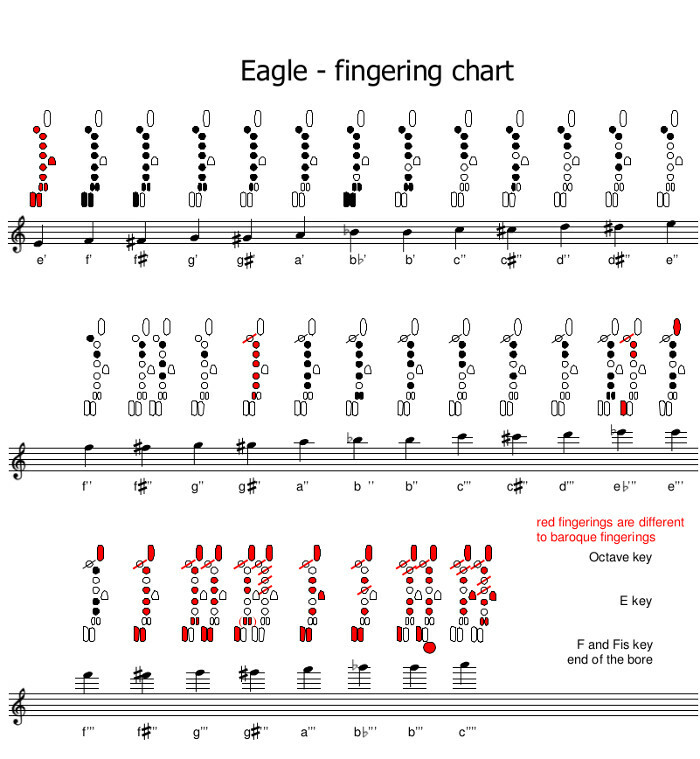 How can I play in 440 instead of the standard tuning of the Eagle which is 443? How does the octave key work? How do I adjust the octave key? How do I use the E key, F Key and F# key? Can I change the metal labium? Do I need to oil the Eagle? Do I need to oil the keys? Is it necessary to warm the head joint before playing? How do I use the anti-condens solution? How do I adjust the thumb rest? Do I need a head joint that’s adjusted to my breathing type? Adriana Breukink began building Eagle recorders in 2008. 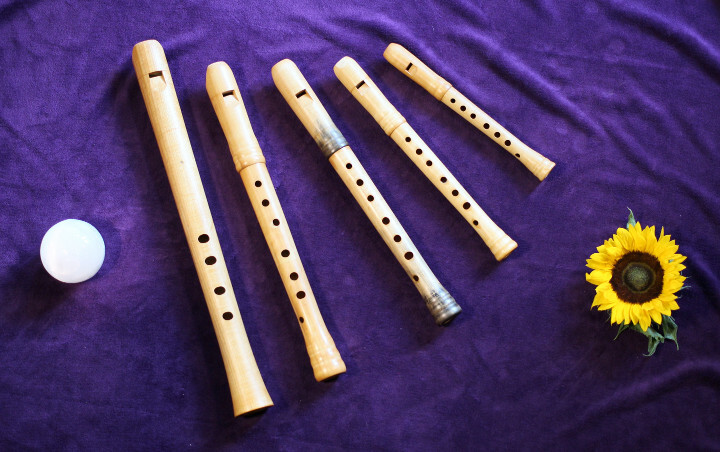 The original idea was to create a recorder that allowed people to improvise and play in a meditative manner. And thus the name was created. In order to have the best possible playing experience it is important to have the correct recorder. Therefore custom mouthpieces and voicings were developed for the different breathing styles (Solar and Lunar). The first “Archaic Eagles” already had this unbelievably large and free sound and the range of tone was 1½ octaves. The sound of a Baroque alto recorder is too silvery and weak, particularly in the first register, to be able to play with modern instruments. The archaic Eagle had potential but too little range. Therefore an instrument with such a large bore simply needs keys. 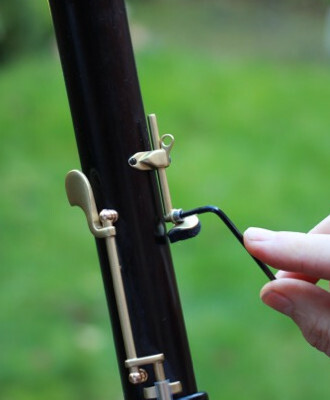 Over the course of the last centuries all other modern woodwind instruments have had keys added to the design. Geri Bollinger, who also quickly became enthusiastic about the project, began to develop keys for the Eagle recorders. 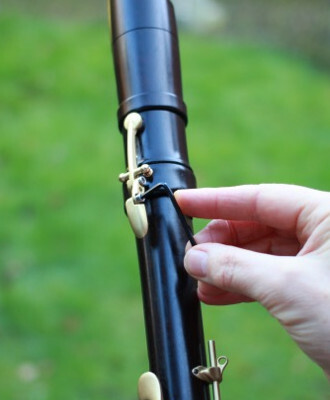 The version from 2009 had the diameter of a normal Baroque F alto recorder. The sound of the low notes was strengthened but access to the higher tones remained difficult. To do that, essentially the octave hole needed to be placed much closer to the labium. The solution was an octave key like that on a saxophone that is operated simultaneously with the thumb hole! In the summer of 2010 Adriana came up with the idea of making an E foot. In this way the Eagle could attain the range of more than 2½ octaves, allowing most of the music literature to be performed. In 2011 Geri Bollinger designed a thin labium out of stable metal. Therefore the attack is easier and it is also possible to play without the octave key. Of course, the octave key is always present as support. The firm Küng does the turning work and makes the labium and the keys. The sound of the Eagle recorder soars above an orchestra or modern ensemble, like an eagle flying majestically over high mountains. The first ‘Eagle’ was a meditation flute with only 4 holes, tailored to the standard blowing styles described below (see Breathing types). The starting point was to put a new, louder recorder on the market, one that could hold its own against modern orchestral instruments. The prototypes had such presence that they blended very well with modern instruments. The advanced, modern Eagle was developed from this beginning. 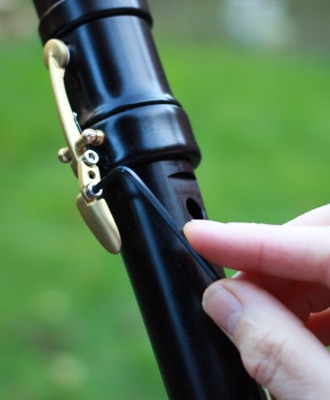 The windway of an Eagle can be customised to the player’s personal blowing style as either ‘inhaler’ or ‘exhaler’ (see Breathing types and alternative voicings); alternatively, the voicing can be ‘neutral’. Yes, the sound is much, much louder and has more presence. Yes, on an Eagle you blow the low register strongly and the high register elegantly and without pressure. It is the opposite of baroque recorder technique, where, normally, you have to play softly in the low register and strongly in the high register. The balance of sound is much better on an Eagle. Look at breathingtypes on this website. A neutral head joint is something in between. No, it’s just a matter of ensuring that the voicing matches the player’s breathing style in order to produce the optimum sound for that player. Yes, it makes playing easier and the sound will be more satisfying. Yes, you need +/- 20 % more air, about the amount of air you need for a tenor recorder. A louder tone does not come by itself…. All players get used to this and it is great to learn to use all the hidden possibilities of your body. Because of its wide bore, the fundamentals are stronger. This blends better with modern orchestral instruments. The metal labium gives the sound more presence and volume. The efficient key system makes the Eagle play easily and chromatically over the whole range of the instrument. Yes, but you need strong, modern basses and tenors and you have to blow more softly. Yes and No…. Various factors, such as your physique and learned playing techniques, will influence your breathing and playing. So it may sometimes appear that you have some of the characteristics of both breathing types. However, far behind these different body energies lies your latent or forgotten basic breathing type. When you support that, it makes playing/blowing easier and more convincing. Also when you’re stressed or nervous you’ll tend to move to the opposite breathing type. You can order tuning rings for free, which will solve the tuningproblems when you pull out the middle joint. 2. as a piano key, in combination with adjusted breath pressure. 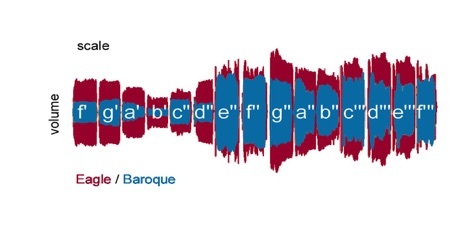 The notes are changed in different ways; in the first octave, the notes become a half tone higher; in the second octave the pitch changes become smaller and smaller, the higher you go. You are strongly advised not to to change the metal labium. The labium is adjusted very precisely by the makers. When the atmosphere is dry, you can oil a little. Be careful not to deposit oil on the key pads. If the keys are starting to become noisy, you can oil the key-system with special oil such as ⇒this. Yes, a grenadilla head joint will not be so prone to clog up if you warm it very carefully before playing. Allways warm the head joint thoroughly before you play. 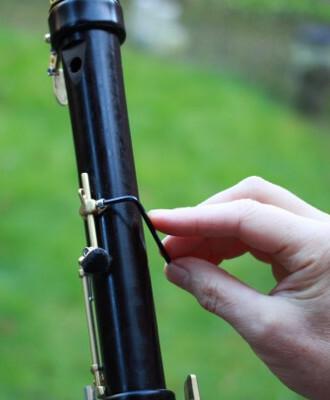 When the windway is tending to clog up too much with moisture – in spite of thoroughly warming the head joint before playing - you can put in anti-condens. Don’t forget to warm the head joint before playing! It’s recommended. Your technique and blowing will be well supported, when your Eagle’s voicing matches your blowing type.